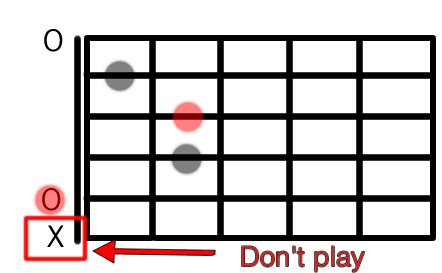 If you’ve just started learning guitar, you might find that you’re having difficulty getting your fingers to go where you want them to – but stick with it! With regular, accurate practice, you will see an improvement. But what should you learn first? Is there a correct order? Well, not really a correct order however I do recommend to all of my students that they should learn their basic chords as soon as possible – what I call ‘the big eight’. These 8 chords will keep cropping up as you learn and if you don’t get them down now, you will find that they will hold you up in the future when you’re trying to learn songs. They might take some time to master but if you can aim to get them sounding clear and committed to memory in around 4 weeks then you are doing well. Below I have outlined your 4 week program – patience is the key here, stay relaxed and have fun! Need help reading the diagrams? Read the guide here. In the online lessons here you will see a lot of charts and diagrams. Essentially, each one is a picture that tells you where to put your fingers on the fretboard. 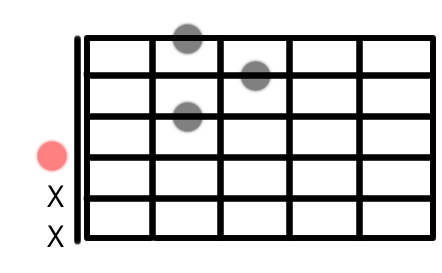 Here is a chord diagram telling you how to play the chord E Minor (written as Em). 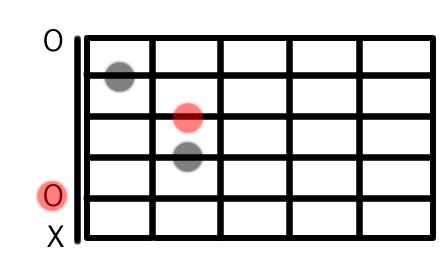 What are the red dots? 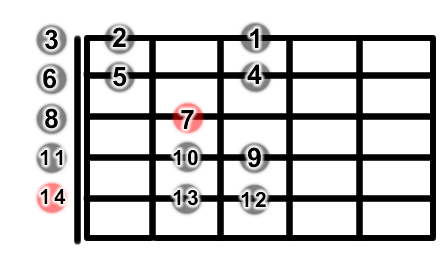 Every chord has a root note, which the chord is named after. For example, the root note of ‘Em’ is ‘E’, the root note of ‘Am’ is ‘A’ etc. The red dots highlight these but don’t worry too much about them to begin with, they’re just for reference. The thick string (E) is shown on the bottom of the diagram and the thin string (e) on the top. 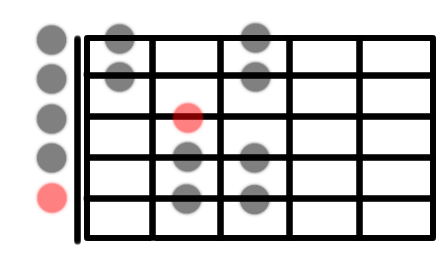 The dots on the fretboard tell you where to put your fingers. 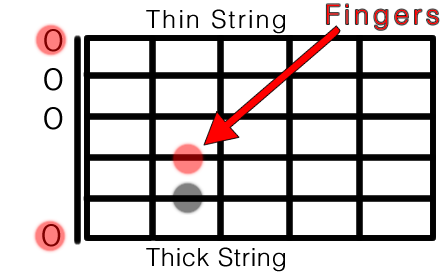 In this case, it’s the 2nd fret on both the 2nd thickest string (A) and the 3rd thickest string (D). 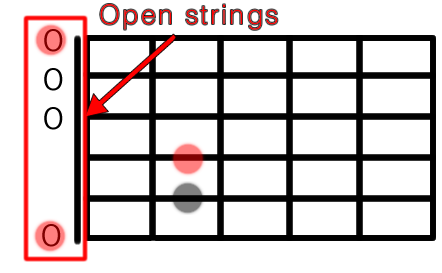 The circles on the left indicate the strings that you play ‘open’ – meaning no fingers are used on those strings. Some chords such as the one below (Am) have strings that we don’t play. These are indicated with an ‘X’. On the left is a diagram showing the pathway for an A minor scale. 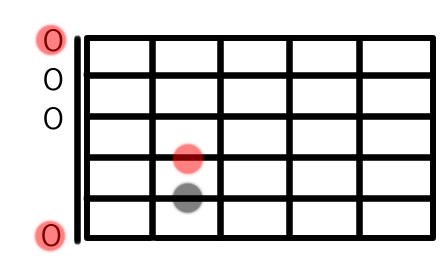 The red dots are the root notes, as explained above. Again, make a note of them for reference, but at this stage don’t get too hung up on them now, they will come in handy later.